Canada and Arizona, prepare to be bombed by a World War Two relic. 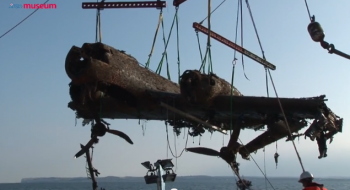 Not that long ago Wargaming.net brought a virtual Dornier - a recreation of the last surviving aircraft, recovered from Goodwin Sands thanks in part to Wargaming.net - to RAF Cosford, and now it's going on a global tour. From 16th October the bomber can be experienced by visitors to any of the following museums: Museo del Aire Madrid Spain, Warsaw Museum of Polish Military Technics Poland, Musee de l'air et Espace France, War Museum Overloon The Netherlands, Great Horwood C of E Combined School England, Canada Aviation and Space Museum, The Air Force Museum of New Zealand and the Pima Air & Space Museum/Arizona Aerospace Foundation. "This heralds a new era of exhibition display and what Museums can achieve," said Air Vice-Marshal and RAF Museum Director General Peter Dye. "For the first time ever the same 3D exhibit is visible in defined physical sites around the world." The 3D model is based on an aircraft forced down on August 26th, 1940, during the Battle of Britain, and which was recovered, almost intact, in June 2013. Despite 75 years of marine encrustation, the Flying Pencil was in near perfect condition; it even had what seemed at first glance to be loaded machine guns, which caused the recovery team some concern until Army EOD confirmed the weapons were out of ammo. "One of the challenges museums face is how to reach a younger generation, a demographic that author Mark Prensky called 'digital natives'," said Wargaming's Tracy Spaight. "Wargaming.net is pushing the envelope to create interactive experiences that will help enrich our historical understanding and bring a new generation to museums."